Thank goodness for places like this, where cocktail dresses fit in perfectly. 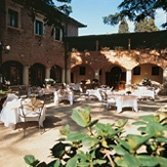 The private villa was converted to a hotel, so settle in for some refined dining and try not to drive the sommelier as crazy as this diner did (you might want to start with a local white Grechetto before you move on to Montefalco Rosso). Fireplace by the front door. Guest chefs sit in to work wonders, but locals come for a special night out when the regular is on duty, too. Book the room on the top for more thrills.